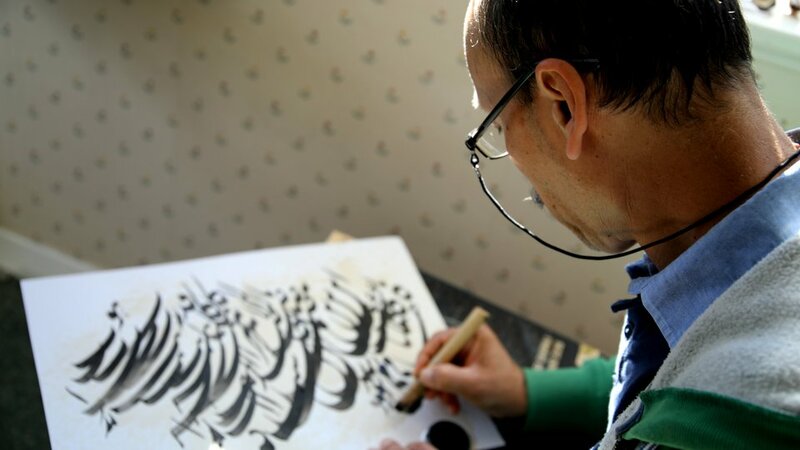 Sayed Ali Karam Jawhary has been practising calligraphy for over 25 years, Communications advisor, Gemma Snowdon, went to find out more about how the art form has become part of his identity. Ali sits on his bed with a look of concentration clouding his face. The sun peeks through the venetian blinds, lighting up the paper he is so focussed on. 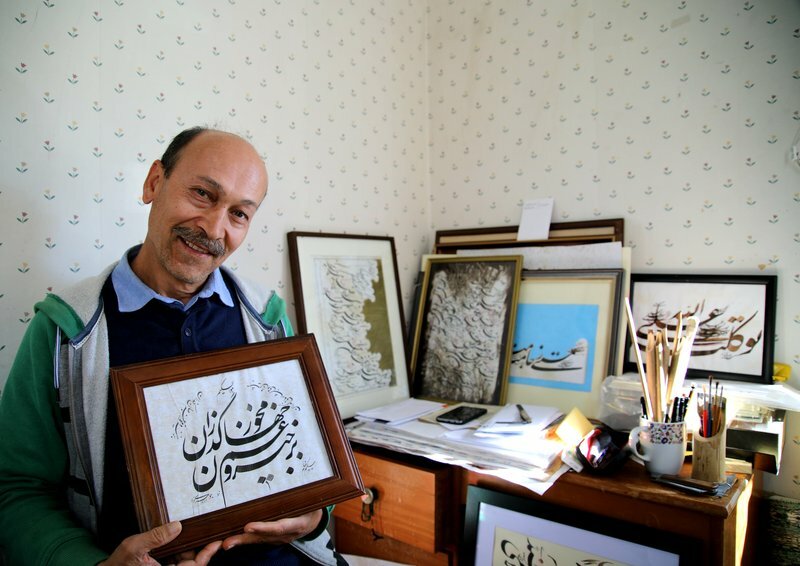 The Afghan man has been practising calligraphy since he was a teenager. It’s become an important part of his identity over the past 25 years and one that allows self-expression. “Everyone has feelings; how they feel and think about life and love, but this calligraphy is the way I tell people how I feel. I think this is the reason most calligraphers do it,” he says. Today Ali sits down and begins drawing in what seems like a freeform fashion. He assures me it isn’t though, and that he always knows exactly what he will create before starting. Using the pens he’s painstakingly carved from bamboo, the artist carefully but confidently puts ink to paper. Ali tells me that the quality of the page is important and it’s difficult to find the right kind in New Zealand. In fact, most of the instruments necessary to calligraphy are difficult to come by here and, when he first arrived in the country, Ali was unable to practice because he couldn’t find the resources. “I couldn’t find the paper, the ink, the bamboo, anything,” he says. With help from Red Cross Pathways to Employment advisor, Claire Speedy, Ali has built up his supplies and managed to pursue his passion in New Zealand. Well, most of the supplies. Today Ali is using the back of a poster. He’s found that they are a suitable replacement for calligraphy paper because the glossy texture allows the bamboo to glide across it properly. There are powerful links between poetry and calligraphy that become clear when I ask Ali to explain the meaning behind today’s creation. “It’s the rain that causes the growth of flowers, not thunder or lightening,” he says, tracing the brush strokes with his fingers. Like many people who have been refugees, Ali has a painful story to share. He was forced to flee his home country of Afghanistan when he was a small child. “Everybody knows about the trouble in Afghanistan and its bloody war,” he says. Eventually his brother was granted resettlement in New Zealand and later applied for a family reunification visa for Ali and his family. In 2013 the visa was granted and Ali was able to move over with his son who is now studying pharmacy in Dunedin. The two of them are now hoping that Ali’s passion will play a big part in their future in New Zealand. “I would like to show my calligraphy to people in New Zealand,” he says. Ali is already thinking about and planning for the future, which includes considering the different tastes Kiwis have. “I have one Kiwi friend on Facebook and he’s only ever liked one of my pictures that I’ve posted,” Ali says with a shrug. He points out which one it is to me. The artwork features more colour than some of his other pieces and suggests that might be the key pleasing Kiwis aesthetics. Ali’s dream is coming closer to reality: two of his works were recently featured in an exhibition for World Refugee Day. Both the pieces he submitted sold within the first week, proving Kiwis do have an appetite for his art. Many former refugees such as Ali have transferable skills that can be an asset to businesses in New Zealand. If you’re an employer with an available position you can support refugee resettlement by offering a job to one of our newest Kiwis. Contact your local Pathways to Employment team here.